You won't see many political signs driving through Walpole, Massachusetts, because some residents say they refuse to put them up. "I think there's a lot of disappointment," said resident Phil Dubois. "I wouldn't put any one of those signs up at my house, to be honest with you," expressed Walpole resident Ritchie Jennings. It's hard to miss political signs that are actually up in the town of Walpole, especially the one in front of Michael Liotta's home, since it's nailed onto a tree, about 20 feet high. "I said I'm going to put it higher this time. And we'll see if they can come and get this one. Well, we'll see," Liotta, a veteran, explained. 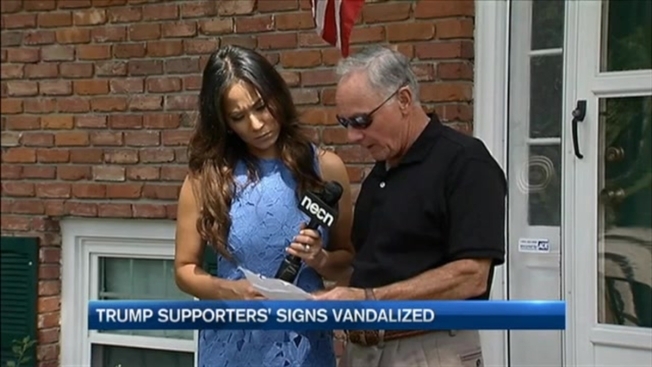 This is the fourth "Trump 2016" sign he has put up in the last weeks after last three were stolen. But it was the last incident that really got Liotta upset. Whoever stole the sign also left behind a note, which read in part, "People of your kind are in fact, the most dimwitted, low level, simpletons that any well-developed nation has to offer. I, and any other American who is against Mr. Trump, am better than you in every single way imaginable (especially in the areas of intelligence, reasoning, and problem solving.)" The letter went on to say, "I have once again taken your sign and will do so again." The writer signed off with an initial, "S."
Kathy Panos lives next door. She says she has also had political signs taken from her lawn in past elections. "I think it happens on both sides. And since then, I don't put signs out anymore. I feel it's better to not know what my opinion is," Panos said. But Liotta is choosing to keep his signs out, saying, "I had to use an extension ladder to put this up, so they're going to need one, too." He added, "Who is someone to come on my property and take my possessions? I would never do it to anybody else. No matter what their political beliefs are. That's my right as an American."